To see all available API calls and configuration steps please visit the API Documentation page. The VictorOps API will allow users to take the custom actions they want and gather the information they need. The following article will walk you through what it takes to get started with the API and outline some of the limits currently in place. To get started with the API login to the VictorOps web portal and go to Settings then API. From here you can retrieve your API ID and have the opportunity to create your API Keys. Your API calls will be tallied on this page. Note: Only VictorOps admin users can create API Keys. There is a limit of 5 API keys per VictorOps organization. Each individual call is rate limited. For specific details please contact support. The API is only available to Paying accounts, free accounts will have no access. 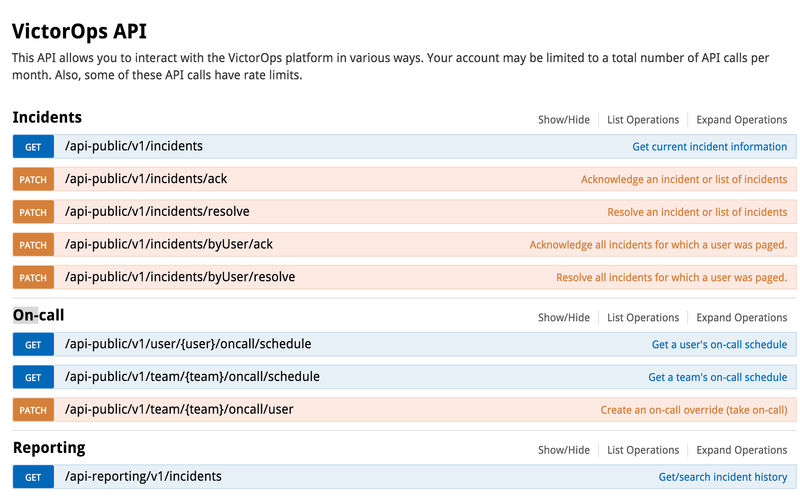 The documentation for the VictorOps API allows you to try out the different calls in real time. To get started select Read the API Documentation link on the API settings page. This will bring you to the VictorOps API documentation. All available API calls are listed here. If there is an API endpoint you would like to see added HERE please let us know! This will be a living/growing document, and we want your input. Please reach out to success@victorops.com with any additional requests.